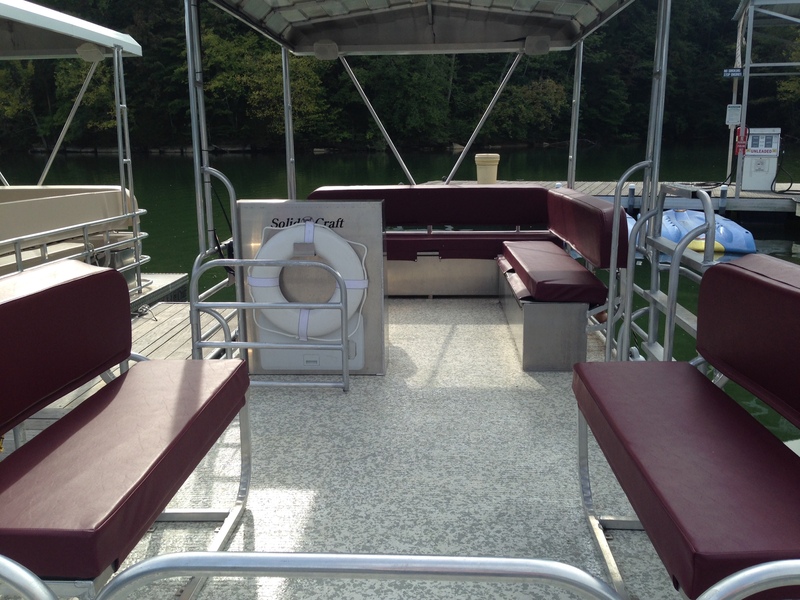 We have six pontoon boats to rent at Holiday Landing Marina, available all year. 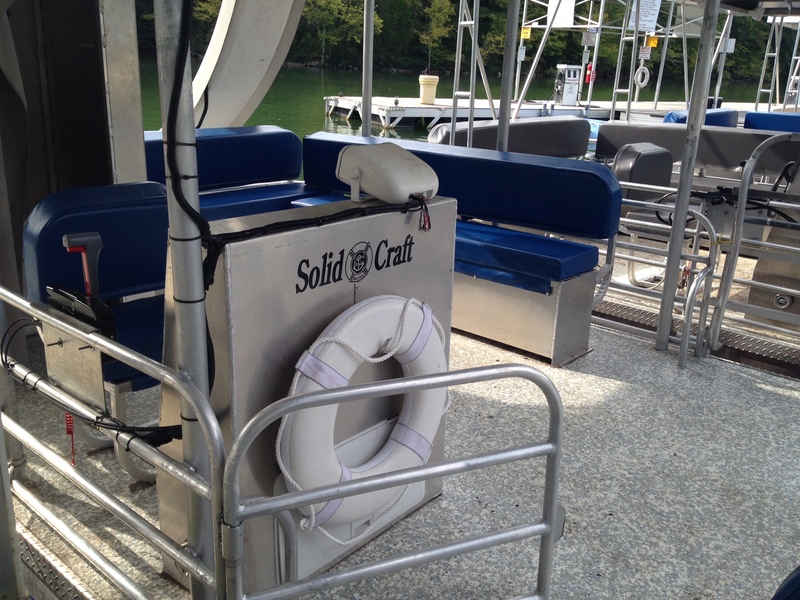 Our boats were custom-built by Solid Craft in 2014-15. 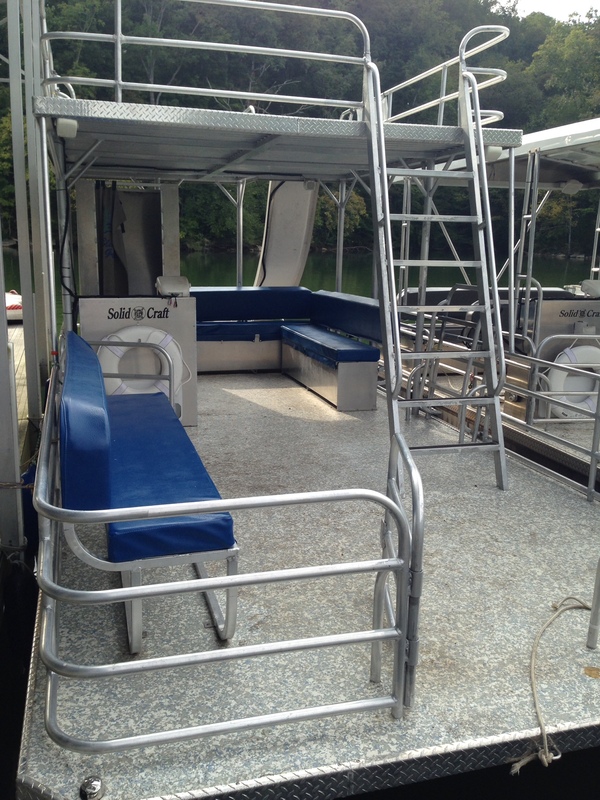 Their metal frame construction makes them exceptionally durable--ideal for the occasional or inexperienced boat operator, tourists,large groups, families, children, and pets. Designed for safe cruising or dropping anchor and swimming, with excellent fuel economy. Not recommended for high speeds or water sports. 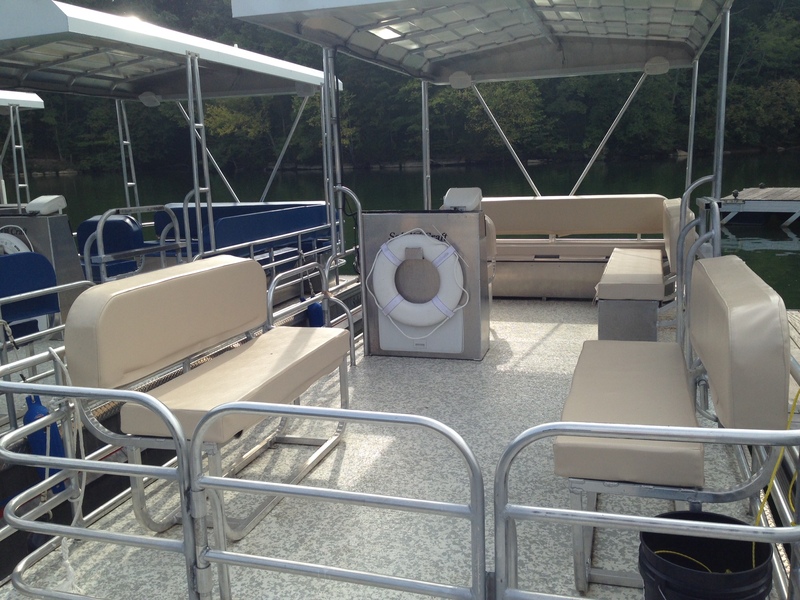 Spacious decks allow room for groups to bring lunch, coolers, floats, and more. Motors are Suzuki 70 HP, 24 feet long overall. 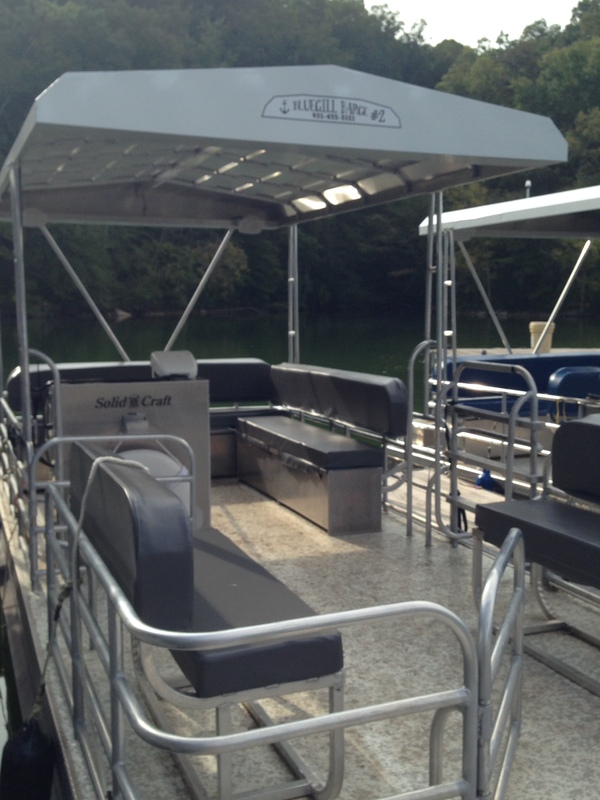 Four pontoons each have a capacity of 2300 pounds or up to 10 people. Four bench seats total, with two of these and the captain's chair under cover. Stereo system with radio and auxiliary input. 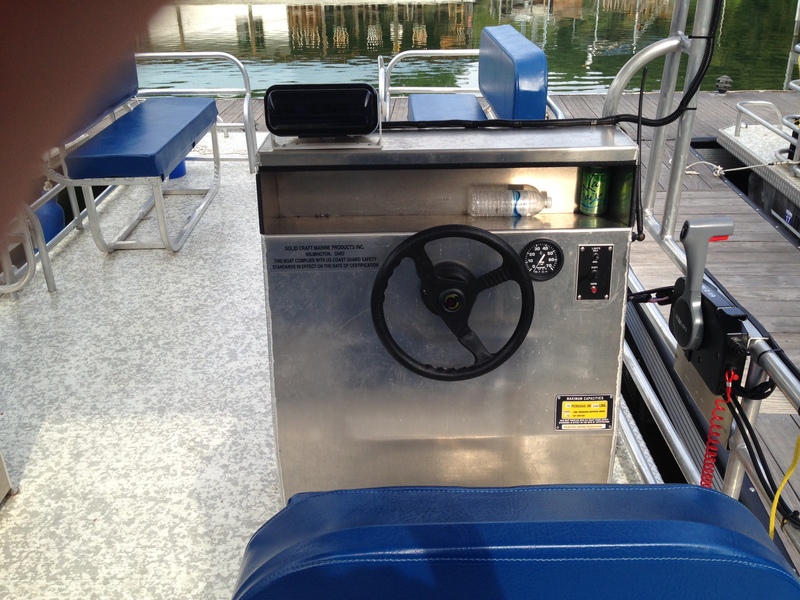 Life vests are stored under bench seats, life preserver and fire extinguisher mounted for quick access--everything you need for a safe voyage! one with a capacity of 3000 pounds or up to 12 people. It includes all features above PLUS an upper deck, bathroom facility, and slide. one with a capacity of 3800 pounds or up to 18 people. It includes all features above plus an upper deck and TWO slides. Prices do not include sales tax or fuel. Please call 931-455-3151 to make a reservation! Half days are available on weekdays at half the daily rate. Rates DO NOT include sales tax or fuel, all boats will be fully fueled at the time of rental--you will be charged for the fuel used when the boat is returned. If you were born after 1989 you must have completed the boater's safety course. Reservations can be made over the phone (931-455-3151) or in person and require a valid credit card to complete. The card will not be charged unless you don't cancel properly (24 hours prior to rental date) or don't show up for the reservation at all. In the event of a no-call, no-show reservation, the card on file will be charged the full rental amount + sales tax. In lieu of a cash deposit, the card information will be kept on file to cover any damages. These policies are explained in detail in our rental agreement, available in person.